Timothy E. Dreisbach, age 61, of Ashland, passed away Friday, July 4, 2008 at his residence. He was born on May 10, 1947, in Akron to the late Farrell and Evelyn (Hughes) Dreisbach. 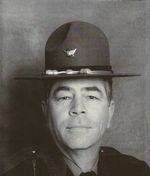 He had resided in Ashland since 1982 where he was a Sergeant with the Ohio Highway Patrol, retiring in 1997. Following retirement, he was a massage therapist and then worked part-time in security for the Ashland Municipal Court. While in Ashland, Mr. Dreisbach attended Trinity Lutheran Church. On August 24, 1968, Timothy married Karen Herwig who survives. Also surviving are a daughter, Kimberly Ann Dreisbach of Blacklick, Ohio,; a son and daughter-in-law, Todd Edwin and Melissa Dreisbach of Uniontown, Ohio; 2 granddaughters: Haley and Taryn; and a brother and sister-in-law Farrell and Martha Dreisbach, Jr. of Aberdeen, Maryland. A memorial service will be held on Wednesday, July 9, 2008, 12:00(noon) at Heyl Funeral Home, 227 Broad St., Ashland with Pastor Jeff Messner officiating. Friends may visit with the family Wednesday, from 11:00 to 12:00 (noon) at the funeral home. The family suggests memorial contributions may be made to Hospice of North Central Ohio, 1050 Dauch Dr., Ashland, Ohio 44805 or the Ashland Co. Cancer Assoc., 1200 E. Main St. Ashland, OH., 44805.